KE00126 is a solid phase sandwich Enzyme Linked-Immuno-Sorbent Assay (Sandwich ELISA). 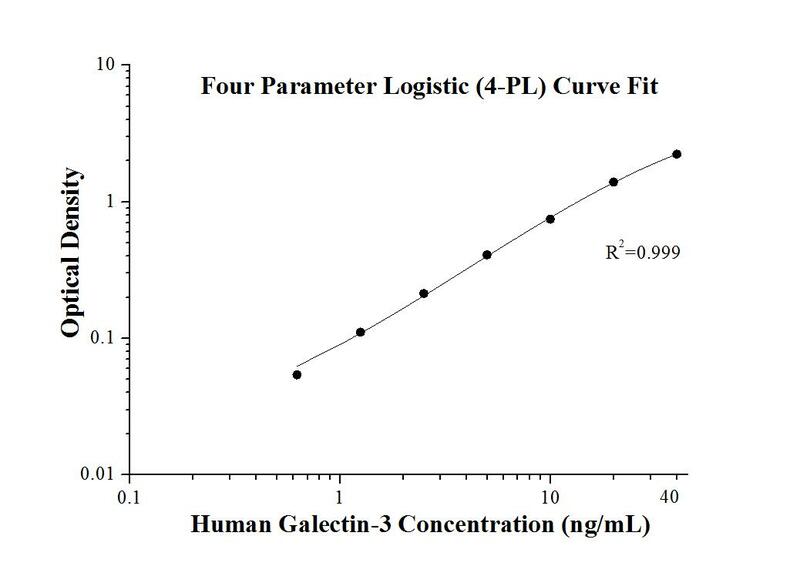 The human Galectin-3 ELISA kit is to be used to detect and quantify protein levels of endogenous human . The assay recognizes human Galectin-3. A monoclonal antibody specific for human Galectin-3 has been pre-coated onto the microwells. The human Galectin-3 protein in samples is captured by the coated antibody after incubation. Following extensive washing, a polyclonal antibody of biotinylated specific for human Galectin-3 is added to detect the captured human Galectin-3 protein. For signal development, Streptavidin-HRP is added, followed by Tetramethyl-benzidine (TMB) reagent. Solution containing sulfuric acid is used to stop color development and the color intensity which is proportional to the quantity of bound protein is measurable at 450nm with the correction wavelength set at 630 nm. Galectins are a family of animal lectins defined by shared characteristic amino-acid sequences and affinity for β-galactose-containing oligosac-charides. Galectin-3, a 31-kDa member of the β-galactoside-binding proteins, contains one carbohydrate recognition domain (CRD) and a proline- and glycine-rich N-terminal domain through which is able to form oligomers. Galectin-3 is widely expressed in many normal tissues and a variety of tumors. It is found intracellularly in nucleus and cytoplasm or secreted outside of cell, being present on the cell surface or in the extracellular space. Galectin-3 is involved in various biological processes including cell growth, adhesion, differentiation, apoptosis, angiogenesis, immune response, neoplastic transformation and metastasis. Elevated serum galectin-3 levels have been reported in patients with breast, gastrointestinal, lung, or ovarian cancer, melanoma, and non-Hodgkin’s lymphoma.